President Russell Begaye shakes hands with Gold Star Mother Jeannette Yazzie at the Gold Star Mother's and Family's Day held on Sept. 24. Navajo Nation President Russell Begaye and Vice President Jonathan Nez recognized and paid tribute to the families of fallen soldiers on Sunday, at a ceremony for Gold Star Mother’s and Family’s Day. The ceremony was held at the Window Rock Veteran’s Memorial Park and is the second recognition event on the Navajo Nation. Before, Gold Star Mothers and Families would have to travel off the Navajo Nation to participate in events to honor their children who lost their lives in military service. Yazzie, along with other mothers, reached out to the Navajo-Hopi Honor Riders and asked for assistance to bring this event to the Navajo Nation. The Navajo-Hopi Honor Riders organization was formed after the death of Lori Piestewa, the first Native American woman to die in combat on foreign soil during Operation Iraqi Freedom. The group supports soldiers by welcoming veterans home, assisting with funeral escorts and organizing the annual Navajo-Hopi Honor Run to visit veterans and their families, which had its 15th anniversary earlier this year in May. 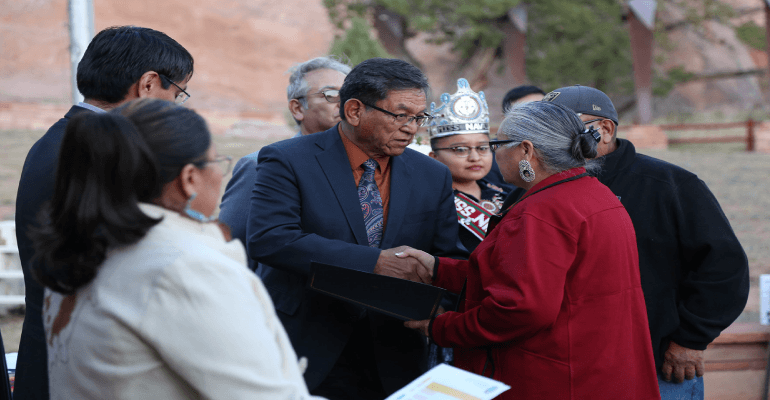 The Office of the President and Vice President and the Navajo Nation Veterans Administration teamed up with the Navajo-Hopi Honor Riders to bring Gold Star Mother’s and Family’s Day to the Navajo Nation. On Sept. 20, President Begaye and Vice President Nez issued a proclamation and designated Sept. 24 as Gold Star Mother’s and Family’s Day in conjunction with the federal holiday, which recognizes the last Sunday of September as Gold Star Mother’s and Family’s Day. President Begaye said that while this is the second year, the Navajo Nation will continue to hold these ceremonies and publicly express gratitude to our fallen soldiers, veterans and their families.